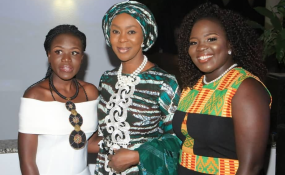 Toyin Ojora Saraki with two members of "The Restorers" team from Kenya honored with the 'African of the Year' award in Nigeria for developing the I-Cut app to combat Female Genital Mutilation. Abuja — "Intimidation threatens to throttle our democracy – all must adopt End Election Violence Advocacy"
Her Excellency Mrs Toyin Ojora Saraki called for an end to election violence and divisive hate speech as she chaired the 2018 Daily Trust African of the Year Award in Abuja on Wednesday. Mrs Saraki praised the winners of the award, a team of five Kenyan girls who developed an app to combat Female Genital Mutilation (FGM), commenting: "They have bravely put agency in the hands of women and girls, restoring not only hope but establishing a concrete link to medical and legal assistance." "We must raise awareness on the urgent need to stem the apparently rising rate of politically motivated violence that is occurring as the various parties conduct their campaigns across our beloved nation." "Here in Nigeria, we also have talented and passionate young people who can overcome the obstacles faced by our fellow citizens. But they can only do so if we end gender violence and the intimidation which threatens to throttle democracy. "In the last week alone, we have seen reports of campaign violence occurring in Lagos State, Imo State, Kogi State, and Kwara State, with many cases of grievous injuries and deaths. This gives us great concern for the safety and security, and indeed the human right to democratic suffrage of civilian citizens as an extremely worrying cascade of wilful impunity, which may affect voter turnout particularly for women and youth. As Nigeria prepares to choose its next leaders, gender-based violence and election violence should be firmly condemned by all, citizens and observers alike. "I therefore call on all to immediately adopt an End Election Violence Advocacy, as a prerequisite to free and fair elections, and to guarantee citizens rights to live and choose their leaders, in dignity, safety and security without fear of intimidation, suppression or retribution from desperate power-seekers. "Many of those power-seekers have failed Nigeria. Since 2015, 9.9 million Nigerians have lost their jobs. 2 million have been affected by Boko Haram and Herdsmen crises, making us the most terrorised country in the world. "We now have the highest number of road fatalities in Africa and are the poverty capital of the world. Our direction of travel should cause consternation to anyone who believes in the dignity of human life. On our current path, by 2021 we will overtake India as the world capital for infant deaths. "Meanwhile, our electricity supply is the second worst in the world – only Yemen is worse. And what of the future? 13.5 million Nigerian schoolchildren are currently out of school, as investors flee Nigeria, taking $2 billion with them. Our debt has grown by $11.47 billion over the past three years. Mrs Saraki's presentation was commended by the former President of Botswana, Mr Festus Mogae, who stated: "Indeed the world is made a better place when ordinary people take up the challenge of doing extraordinary things." Copyright © 2019 Wellbeing Foundation Africa. All rights reserved. Distributed by AllAfrica Global Media (allAfrica.com). To contact the copyright holder directly for corrections — or for permission to republish or make other authorized use of this material, click here.